Use your hands to spread the dough about 3/4″ thick on a sheet pan, cover and set aside for 30 minutes. Just before baking, drizzle the top with olive oil. Then sprinkle with coarse salt, a little dry rosemary and garlic powder. 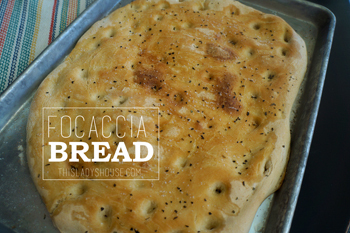 This entry was posted in Recipe and tagged Breads, Side dish.